With athletes and journalists already descending upon the nearly-complete stadiums and athletic facilities in Rio de Janeiro’s West Zone, a new museum here offers an alternative narrative of the Olympic legacy. The Museum of Removals was inaugurated on May 18 in Vila Autódromo, a neighborhood which has been almost entirely razed in order to accommodate Olympic construction. The museum, organizers say, is meant to represent the experiences of the roughly 600 families removed from Vila Autódromo over the last four years within the broader context of favela evictions throughout the city (and the decades). “We cannot allow our struggle to gain rights to the city and to stay on the lands where our lives were built to be forgotten,” museum organizers wrote in an open letter to the public. First settled by fisherman in the 1960s, Vila Autódromo grew as workers at the neighboring racetrack began building homes in the area. Most of Rio’s 1000 favelas, or informally settled neighborhoods, were developed without government regulation and without legal title to the land. Vila Autódromo was no exception. Residents built homes and developed infrastructure and sanitation services independent of government support. By the 1990s, real estate speculation in Barra de Tijuca, in Rio’s West Zone, was booming, and dozens of gated condominiums were constructed along the Jacarepaguá Lake next to Vila Autódromo. A 1992 attempt to evict Vila Autódromo was overturned by the State Government, which then issued the community a 99-year lease on the land in 1994. In 2005, the government declared the community a Special Zone of Social Interest, which demarcated the area for the preservation and development of affordable housing. When the International Olympic Committee announced in 2009 that Rio would host the 2016 Summer Olympics, initial plans to develop the Olympic Park left Vila Autódromo intact. Shortly thereafter, however, city government issued eviction notices to some homes in the community, claiming it needed to build an access road to the Olympic Park through the neighborhood. Residents responded by mounting a campaign with the support of local urban planners, public defenders, professors and students to resist the removal effort. This coalition developed the People’s Plan, which offered an alternative design of the Olympic Park that both preserved Vila Autódromo and introduced essential urban upgrades in the community. Despite receiving international recognition, including the Urban Age Award by Deutsche Bank and the London School of Economics, the People’s Plan was never considered by the city. After years of back and forth, hundreds of residents who had adamantly resisted removal ultimately accepted resettlement housing or compensation, though dozens of homes were demolished without prior notice. In one instance, the home of an elderly resident was demolished when she was at a doctor’s appointment, returning to find her home and possessions destroyed. Over the last four years all but 20 families have left Vila Autódromo, with most relocating to nearby public housing. Today the site more closely resembles a war zone than a vibrant community, with dozens of partially demolished homes, piles of bricks and abandoned furniture marking the places where homes once stood. The city is currently rushing to clear the rubble before the Games begin in August, but the open air museum invites visitors to walk around what remains of Vila Autódromo to observe seven art installations. These installations are located on the sites of former homes and community spaces, now vacant lots littered with bricks and trash, and constructed using materials left behind by the demolitions. While the art commemorates destroyed physical structures such as homes, a park, and the neighborhood association, the unifying theme explores the deep sense of loss and betrayal experienced during this long, fraught removal process. “This museum serves mainly to immortalize an exhausting struggle and the great suffering of families who had their trampled rights violated by an irresponsible, reckless and petty government,” said Luiz Cláudio Silva, a longtime resident of Vila Autódromo. 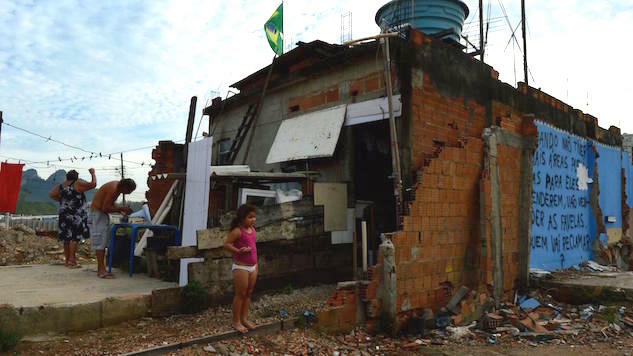 City officials maintain that most Vila Autódromo residents willingly accepted compensation or fair compensation for their homes. An “Olympic torch” entitled “The Light Does Not Go Out,” was constructed using debris from the community. Many of the installations in the Museum of Removals reference the Olympics. One of the main objectives of the museum is to dispute the city’s narrative that removals for the Olympics have been small in scale and fair to residents. Thainã de Medeiros, one of the designers of the museum, takes issue with the way Rio’s city government discusses removals. “Mayor [Eduardo] Paes has said consistently in interviews that Vila Autódromo was not a cruel removal and that there is ‘an over-dramatization of removals’. The museum shows that process by which Vila Autódromo was lost and that it is not exaggerated,” he said. According to government data, at least 22,059 families—over 77,200 people—have been removed in the city of Rio de Janeiro since 2009, with over 2,400 under threat of removal. While some of these removals have been due to precarious building environments, the majority have been to accommodate infrastructure projects such as the Bus Rapid Transit system that are closely associated with the Olympic Games. The Museum will likely be demolished in upcoming weeks as the City urbanizes what remains of Vila Autódromo, experiencing the same process of removal that it seeks to bring attention to. For now, it serves as a striking reminder of the toll Olympic preparations have taken on some of Rio’s low-income residents.